Here at Adore Bridal, in business since 2011, we carry all kinds of bridal wear. From modern and whimsical to traditional and classic, you are sure to find the perfect look here. In fact, we have been making dreams come true for brides, grooms and their parties for more than six years. Our team wants to foster the complete bridal wear-finding experience, assisting you every step of the way. There is nothing we like more than helping you in your quest to locate “THE dress.” Plus, we help you accessorize it too. This is certainly an exciting time for you, and we want to make it special. With a large inventory of wedding gowns, shoes, jewelry and veils, come to us for beautiful bridal wear in Peoria IL. First off, we don’t just sell bridal wear. We show you how to display it best through a perfect fit with the dress itself as well as accessories to complement it. That’s where our professional stylists come in. We give your attire the utmost personalized attention to create a complete bridal look. Consult with your assigned bridal stylist who will have dresses ready for you to try on before you even walk in the door. Serving brides in the Central and Northwest Illinois areas, we stock our store with the best designers all along the price spectrum. In addition to bridal wear, we have bridesmaids wear as well as groom and usher wear. It’s our job to make you look stunning when you walk down that aisle. From the head piece to the shoes, you’ll make an impression on every single guest. 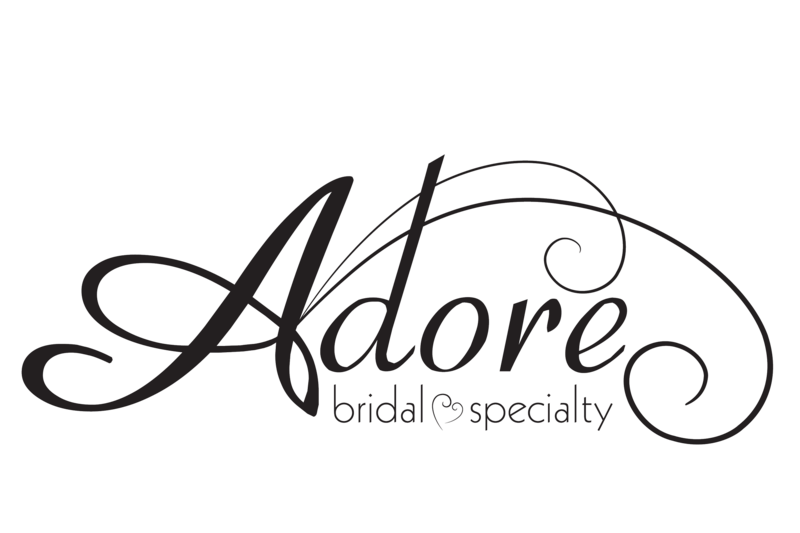 To book an appointment for bridal wear, call Adore Bridal at 309-291-0838 or schedule your appointment online. Are you ready to find the gown of your dreams?